This time of year, even the hardiest of snow lovers are happy to drink in a little bright spring color. 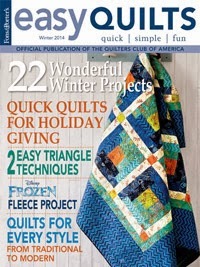 Wendy Sheppard's "Hoppity Hop" quilt, featured in the Winter 2014 issue of Easy Quilts, is just that. Cheery frog prints from the Leap Frog collection by Greta Lynn for Kanvas, hop all over this fun quilt, made with lily pad looking blocks. Below, Wendy talks about her Hoppity Hop design. Watch for a tutorial by Wendy using the Leap Frog prints in next week's Novelty Print Blog Hop! What attracted you to the Leap Frog fabrics? Favorite print in the collection? My favorite print is the focal border stripe print. I actually like everything about this line because it is such a fun group of fabrics. Tell us about your lily pad block. It's a coin block, which is a variation of a snowball block. I have been experimenting with readapting square blocks for rectangular presentations. So, it was really nice to be able to have that block turned out to look like a lily pad to suit the theme of the fabric line. 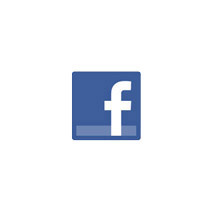 Did you know you wanted to use the "frog stripe" as a border? With the colors I already had in the quilt center, I needed something to tie everything together. I thought the green border would do a nice job of doing that, as well as keep the theme of quilt visible. I like that is so cheerful and bright - and very easy to construct! How did you quilt it? I used my Jester's Hat for the allover quilting on the quilt because I see the quilt being a utility quilt for a child. As for the rounded zig zag in the white border, I was actually using the quilt to try out a something new! I found that to do the rounded zig zag right, I have to have better control in moving my quilt sandwich. My rounded zig zags on that quilt are not perfect, but I did learn something going forward for future quilts. What do you picture this quilt being used for? I see this used as a child's play quilt. It would be perfect to take on a picnic in the summer time! And frogs and bugs aren't just for boys! My daughter loves this quilt too. Click here to see the entire Leap Frog collection and find another free pattern, "At the Pond," by Wendy using these prints as well. Click here to read Wendy's post on this quilt. 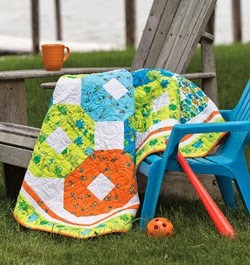 Click here to find Easy Quilts. Wendy did an awesome job highlighting these fabrics. Very cute! Such a perfect toddler quilt! It's a different look at Hugs and Kisses! I'm showing mine on the blog now, made for my most recent granddaughter. Avery cute quilt! My granddaughter would love it! The colors uyou have used is very attractive.